Five downtown businesses were recognized for designing great holiday storefronts that compel admiration and extra sales from passersby. The Celebrity Judges Panel for the 8th Annual Downtown Holiday Storefront Contest was comprised of three community leaders, including Davis Blais, Director of Daniel’s Table and co-owner Foodie Café, Herb Chasan, Director of Hoops and Homework, and Don Cavicchi, owner of Cav Audio and Video Design and a 2017 Team Framingham Boston Marathon runner. For the People’s Choice Award, 248 votes were received for 10 different businesses during the three-week voting period. Atlantis Dental was the narrow victor, nabbing 39.9% of the vote over JR&D Services, which earned 36.3% of the vote. 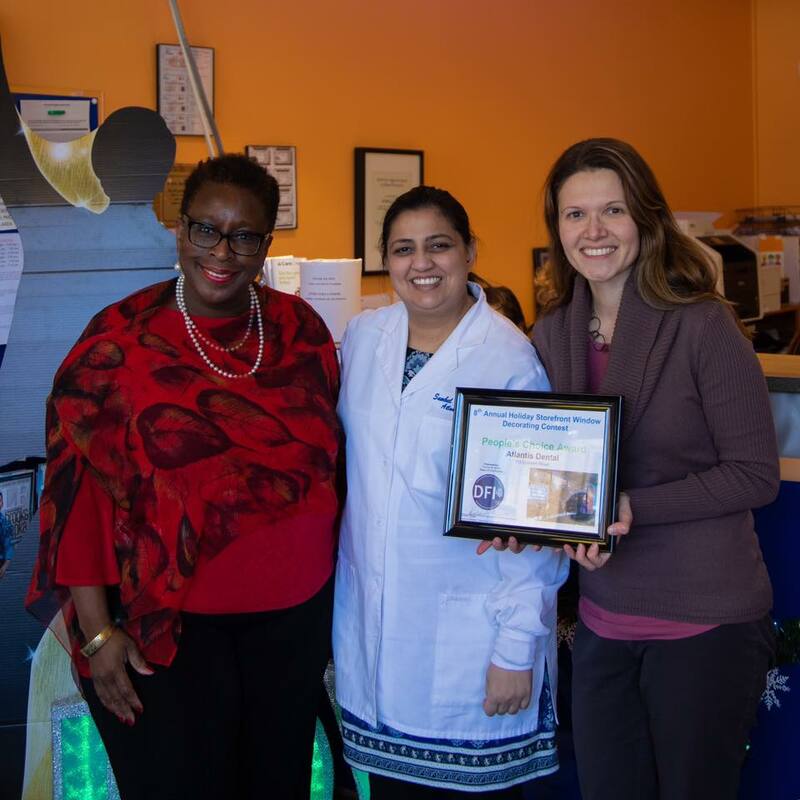 On January 17, Framingham Mayor Yvonne Spicer presented the People’s Choice Award to Atlantis Dental’s owner, Dr. Sumbul Naqvi. Altantis Dental greeted Mayor Spicer with a full lunch spread. Atlantis Dental wins one month of marketing and outreach support and three complimentary window washings courtesy of Downtown Framingham, Inc. The Overall Best Design Award was selected through an aggregate vote from the Celebrity Judges Panel. On January 17, Framingham Mayor Yvonne Spicer presented the Overall Best Design Award to JR&D Services’ owner, Antonio Junior. JR&D Services wins one month of marketing support and three complimentary window washings courtesy of Downtown Framingham, Inc.
Mayor Yvonne Spicer presents the Overall Best Design Award to JR&D Services owner Antonio Junior. The Cutest Holiday Window Award was selected by Herb Chasan, Director of Hoops and Homework. 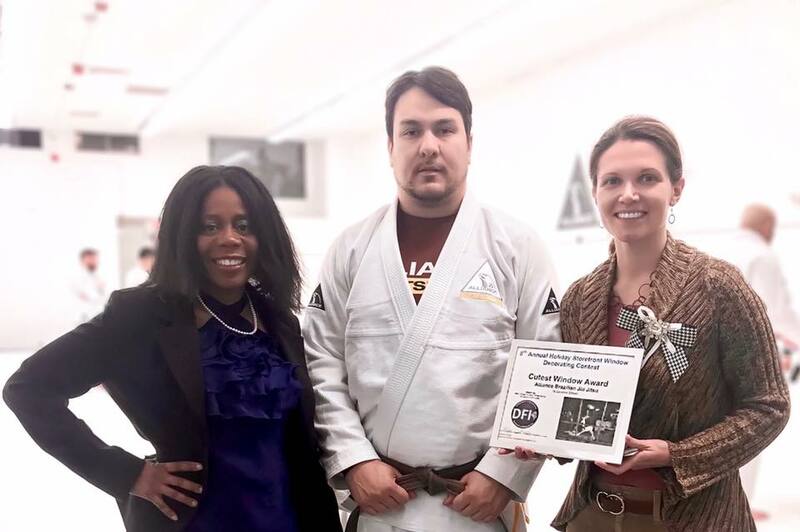 The award was presented by Hoops and Homework Board Director Leslie White Harvey to Alliance Jiu Jitsu’s owner Samuel Almeida on January 14. Alliance Jiu Jitsu wins one month of marketing and outreach support courtesy of Downtown Framingham, Inc. The Cutest Storefront Award was presented by Hoops and Homework Board Director Leslie White Harvey (left) to Samuel Almeida, owner of Alliance Jiu Jitsu Framingham. The Most Creative Holiday Window Award was selected by Don Cavicchi, owner of Cav Audio and Video Design. 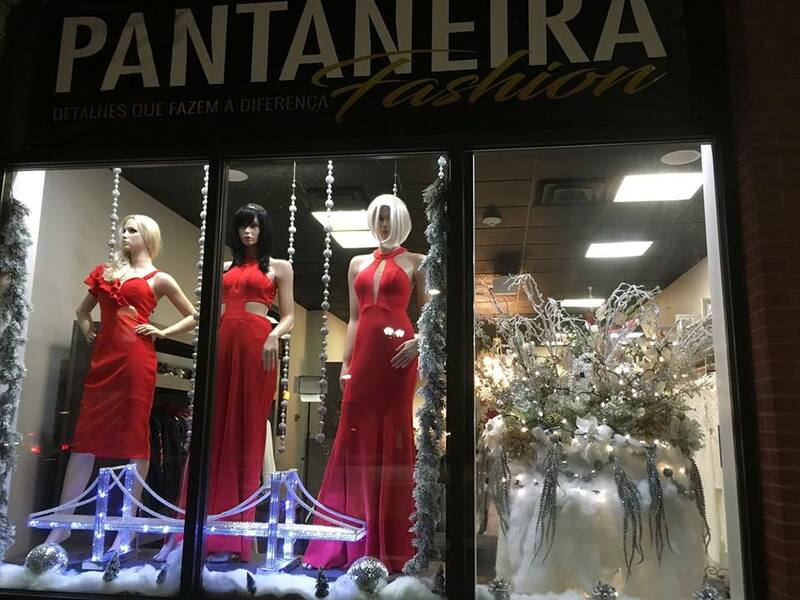 The award was presented to Vanderleia Sales, owner of Pantaneira Fashion, on January 14. Pantaneira Fashion wins one month of marketing and outreach support courtesy of Downtown Framingham, Inc.
Don Cavicchi (center left), owner of Cav Audio and Video Design, presents the Most Creative Storefront Award to Vanderleia Sales (right), owner of Pantaneira Fashion. The Most Traditional Holiday Window Award was selected by Davis Blais, Director of Daniel’s Table and co-owner of Foodie Café. 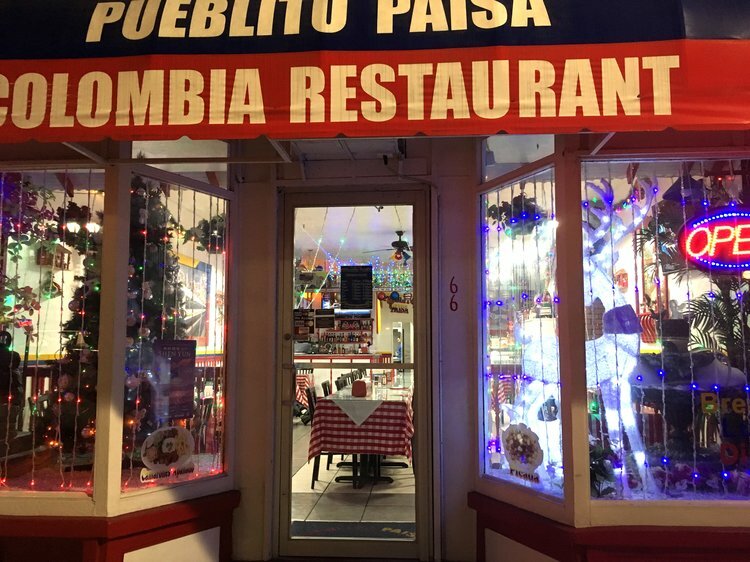 The award was presented by David Blais to Pueblito Paisa’s co-owner Ignacio Jaramillo on January 17. 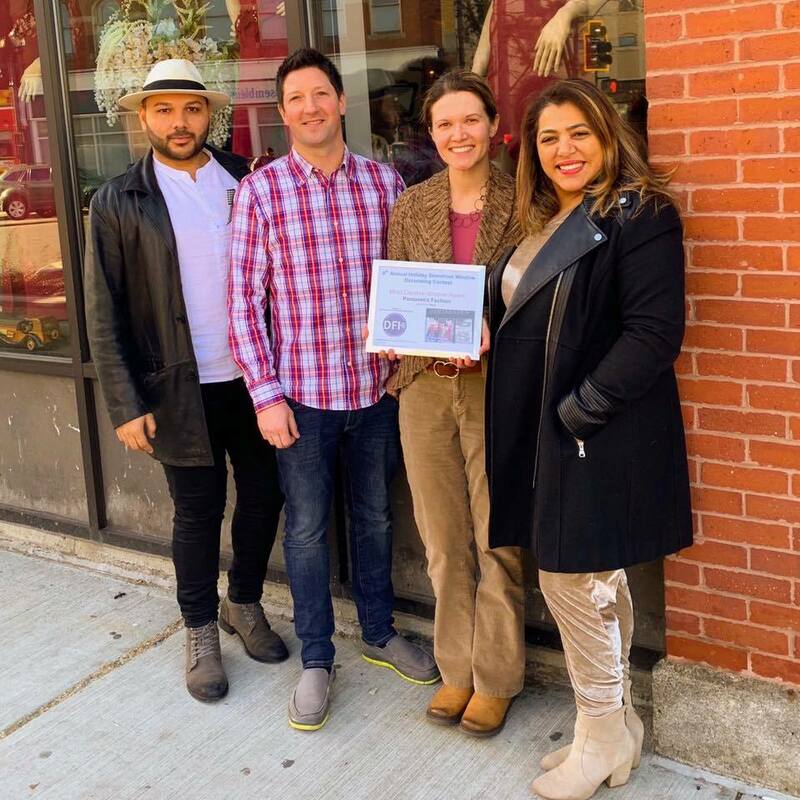 Pueblito Paisa wins one month of marketing and outreach support courtesy of Downtown Framingham, Inc.
David Blais (right), Director of Daniel’s Table and Co-owner Foodie Cafe, presents the Most Traditional Storefront Award to Ignacio Jaramillo (center), co-owner of Pueblito Paisa.